Don't miss the upcoming winter production of Oedipus the King, by Sophocles. Oedipus is directed by Martha Johnson, with scene and lighting design by Michael Burden, costumes by Sandra Schulte, and choreography by Sandra Agustin. Student Andy Langenfeld is assistant choreographer for the show. Oedipus Tyrannus (Oedipus the King) , was first performed in Athens, Greece c. 430 - 425 BBC, and is perhaps the most famous of all ancient Greek tragedies. This masterpiece of irony explores timeless and powerful questions about limits to human knowledge and about human identity. 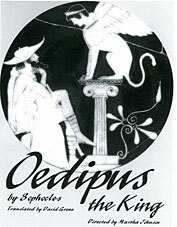 The artistic approach of this production of Oedipus (using the David Grene translation) will be somewhat contemporary: as we enter the 21st century, the production will explore both ancient and timeless aspects of the play through language, acting, storytelling, dance, music, costuming, and scene design. Dave Thompson will play the role of Oedipus; Brian Hesser, Creon; Linnea Mohn, Jocasta; Chris Morck, Teiresias; Angie Hardy, Lindsay Hockaday, Priestesses of Zeus; Andy Bernstrom, the Corinthian Messenger; Carson Lee, the Herdsman; Erin Stuhlfaut, Palace Messenger; Briana Young, Antigone; Kat Ness, Ismene. The choral roles will be played by Lindsay Bonner, Erin Carlson, Andy Langenfeld, Carson Lee, Chris Morck, and Christa Steiner. Performances of the play will take place on February 2-3, and 8-10 at 7 p.m.; and February 4 and 11 at 2 p.m. For reservations, call (612) 330-1257.